Those with a particular passion for history will no doubt prefer one of the two Superior rooms available at Plas Dolmelynllyn Hall, and particularly "Glaslyn" which is situated in the 15th century part of the building. However, whichever rooms you should find yourself (the hotel also features 8 Victorian and Classic doubles) you'll be where Percy Bysshe Shelley spent time while travelling through Wales. The breakfast restaurant room is today named in his honour. Much of the present day building dates largely from the Victorian period (with associated Gothic styling) when it was the property of the MP William Maddocks. However, there has been a building on the site since the medieval period, and parts of the hotel date from the Tudor period. Indeed, those with an eye for architectural detail will find much to consider. 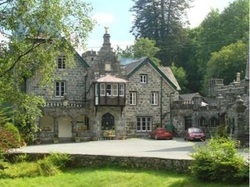 The Plas Dolmelynllyn (or "Dolly Hotel" as it is affectionately known) is just a few minutes away from Dolgellau itself, and welcomes well behaved dogs (notification required).